Bóg wybrał człowieka już w momencie stworzenia. W Adamie Stwórca wybrał wszystkich ludzi (por. Dz 17,26). Stworzenie bowiem jest pierwotnym wyborem (z nicości do bytu). 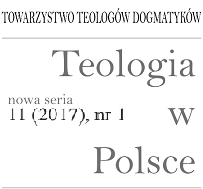 Wybór ten został potwierdzony przez odkupienie dokonane w „Człowieku, Jezusie Chrystusie” (Rz 5,15). Krew Chrystusa została wylana „za wielu” (Mt 26,28; Mk 12,24). Theological understanding of the category of “chosenness” differs from the colloquial usage of the word. The idea of chosenness permeates the Old Testament. Its deeper understanding, however, can be seen only in the Person of Jesus Christ (cf. Ephesians 1:1-12). Correct understanding of the category of “chosenness” requires considering the idea of God’s pedagogy, God’s synkatabasis (condescendentia divina), in the history of salvation and in the Revelation. On the other hand, it should be seen in the personal and communal perspective, which, in turn, enables us to spot the meaning of human freedom in relation to God’s choice and the purpose of actions of God’s Providence.God chose man in the moment of creation. The Creator chose all man in Adam (cf. Acts 17:26). The creation is the original choice (from nothingness to being). The choice in question was confirmed by the Redemption through “the one man Jesus Christ” (Romans 5:15). Christ’s Blood was poured out “for many” (Matthew 26:28, Mark 12:24). Therefore, God did everything to “choose” man ultimately (or to redeem them). The thing that remains, however, is man’s decision as to his personal participation and acceptance of the aforementioned “God’s choice” (cf. Deuteronomy 30:19-20).